How much paper does your homeschool use up from just worksheets in one school year? Chances are, the amount is going to be high. Paper is one product many Americans waste often. Obviously, paper and worksheets cannot be completely eliminated from the homeschool (or any) classroom. However, there are ways to be more eco-friendly with worksheets. As a homeschooling mom who is also all about anything natural or eco-friendly (ok, and I'm also cheap), I don't like to waste anything. Here are some of my ideas for being more eco-friendly with homeschool worksheets. Use recycled printer paper when printing out homeschool worksheets from your computer. There also are textbook rental services. Many homeschool materials can also be obtained through libraries and book swap services. Also check to see if your learning materials are available in ebook format. This way, only the pages that have to be get printed and it can be done on recycled paper. Recycling homeschool worksheets may seem like a no-brainer, but many people no longer recycle paper. Just as aluminum, copper, and other consumer waste products can be recycled, so can paper. Look in your city's phone book or online directory service to find a recycling center that accepts paper. While the plastic used for lamination is not exactly eco-friendly, less paper will be used by laminating homeschool worksheets. Write and wipe or dry erase markers can be used as a writing medium. This way, once the worksheets have been graded, the ink can be erased and the lessons saved for another child or as review for the same child further in the year. If you only have one child, laminate the homeschool worksheets anyway and pass them on to another family. I like to keep ours in binders sorted by grade and subject levels. Cut homeschool worksheets into four even pieces and staple groups of them together upside-down to create scrap pads for note-taking and study. 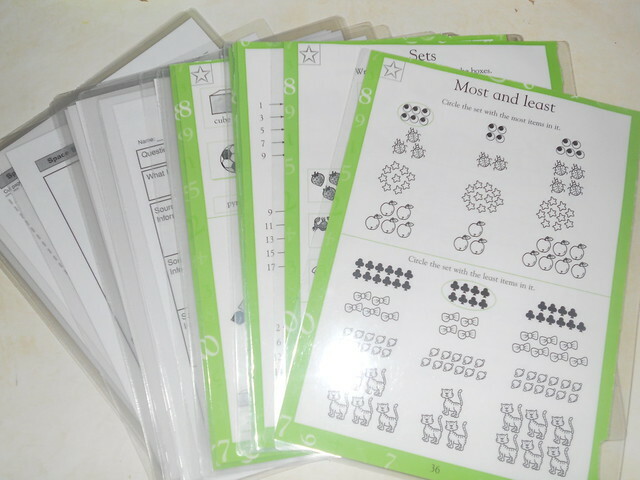 The scrap pads are also great for grocery lists, score pads in family games, and more. Glue a magnet to the back of the last sheet to create a refrigerator notepad. To increase the eco-friendly act of the scrap pads, also use recycled pencils and soybean crayons. Worksheets can be cut up to create bookmarks and other craft projects. Cut them in ready-made bookmark shapes for quick bookmarks. For more detailed ones, cut the worksheets in thin strips, shapes, or even use a hole puncher to create interesting pieces to glue together and laminate for longer use. The same methods can be followed for other paper crafts. For instance, the strips can be used as a filler for gift baskets. Don't forget to reuse or recycle the bookmarks and crafts once you are finished with them.